The fourth century Etchmiadzin Cathedral, headquarters of the Armenian Church. The music was sublime and the head himself was there celebrating mass. He had a very kind face. We head diagonally across the Black Sea (it looks pretty blue today) and across the Caucasus Mountains to Armenia. It’s really windy up in the sky and our plane is bouncing over the snow-capped peaks. Naturally, we are diverted by air traffic control and spend a further twenty minutes jolting around in circles before we finally land. I’m not sure why. There are only four planes at the airport. It turns out that all the men in leather jackets reeking of tobacco and being very loud were Armenian. When we arrive at Passport Control they try every trick in their armoury to get ahead in the queue. Most of them just sidle alongside or even walk rapidly up the edge. No-one challenges them, until one man actually clambers under the ropes alongside the designated queuing path. The attendant sends him back firmly. He just grins. I’m supposed to be picking up the Golden Eagle train here, but apparently the Azeris have scuppered this plan. Relations between Armenia and neighbouring Azerbaijan have been fraught for years and the two countries are technically still at war. 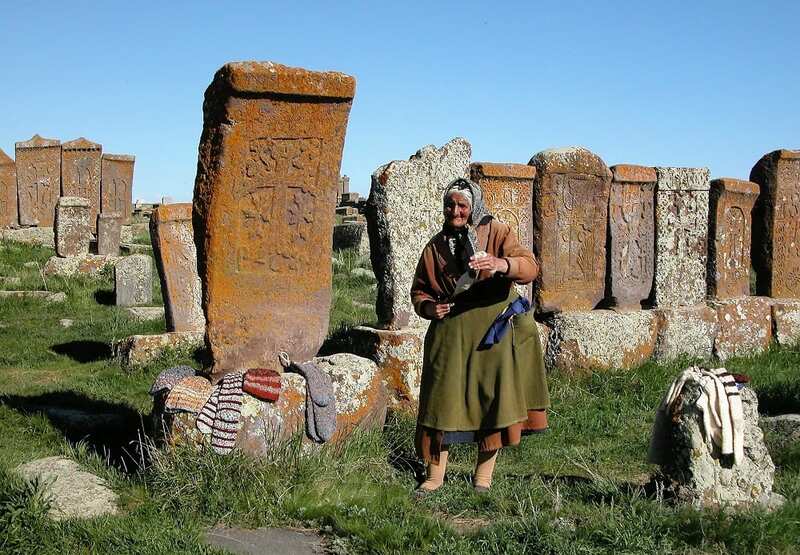 The issue centres around Nagorno-Karabakh, an area of south-western Azerbaijan populated largely by ethnic Armenians. And the Azeris have suddenly decreed that our train may not enter Azerbaijan if it has been to Armenia. So the train is waiting on the Georgian border and we have to do our sightseeing here and then travel by bus on Thursday to meet it. I assume the same rule doesn’t apply to people. This is a ‘luxury’ tour and we’ve all been issued with audio devices, so we can amble around while the poor guide is speaking and wondering if he is just talking to himself. 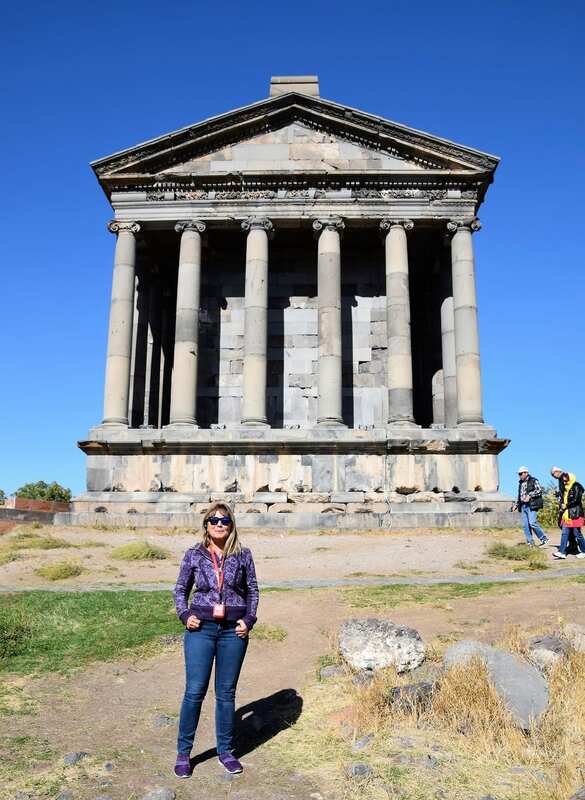 We head out of town, a return visit for me to the Geghard Monastery and the Garni Temple. Both are more notable, as far as I am concerned, for their settings, than their architectural interest. 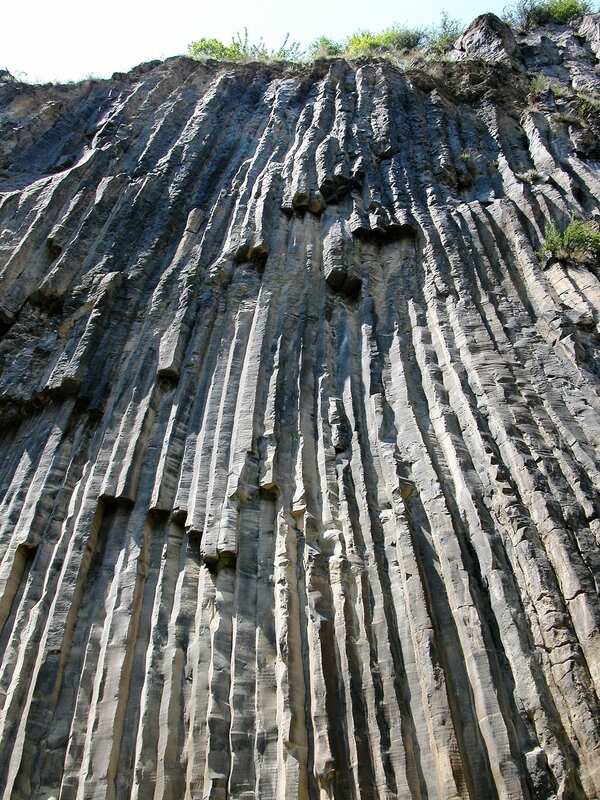 They are both spectacularly set in different rocky gorges. It’s still glorious weather, an Indian Summer is forecast for the Caucasus and Central Asia and there is golden autumn colour in abundance. Mount Ararat, draped in snow, sits to the right for the whole of our drive. It is the principal national symbol of Armenia however, after numerous border changes, it is now actually located within Turkey. 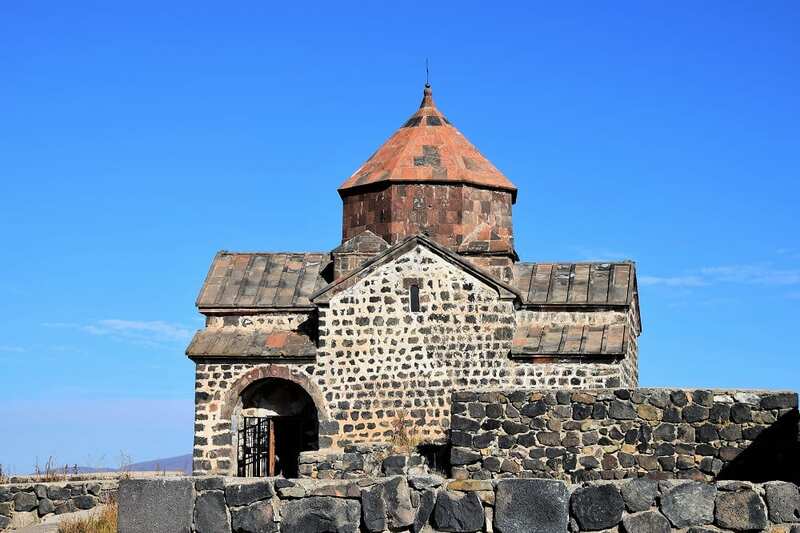 There’s a widely-held belief in Armenia that Noah’s Ark is embedded in ice atop Mount Ararat. 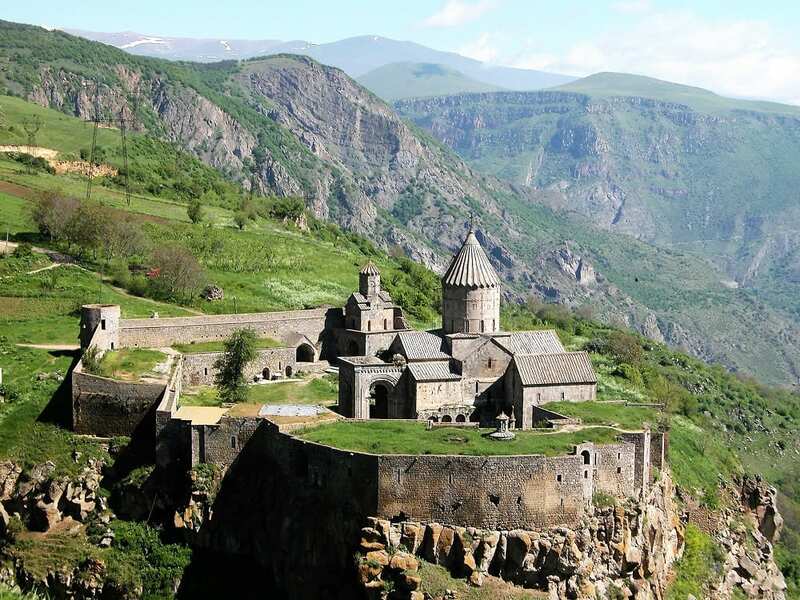 Despite many expeditions, said ark has never been found, (our guide says that photographs have even been taken from space to assist the search), but that doesn’t stop it appearing on Armenia’s coat of arms. Yerevan, the capital nestles in the valley below. No prizes for guessing why they call it the “Pink City”. It is one of the world’s oldest inhabited cities, constructed 29 years before Rome. It hasn’t changed much in the last eight years. It’s still not hugely interesting, there isn’t much left that’s old and Armenia is still the poor relation in the Caucasus. There are a few more Armagnac factories on the drive from the airport. The crane is still in place at the top of the huge Cascades stairway. The traffic is still awful. And the genocide museum is still incredibly moving. We lay white flowers around the eternal flame that burns above the city. In the evening, dinner with Jennifer who lives in Boston. She is really good fun and I met her on my tour to the Balkans two years ago. By some serendipitous occurrence our paths have crossed for one night in Yerevan. We only discovered this via Facebook. Amazing! Really good to catch up. 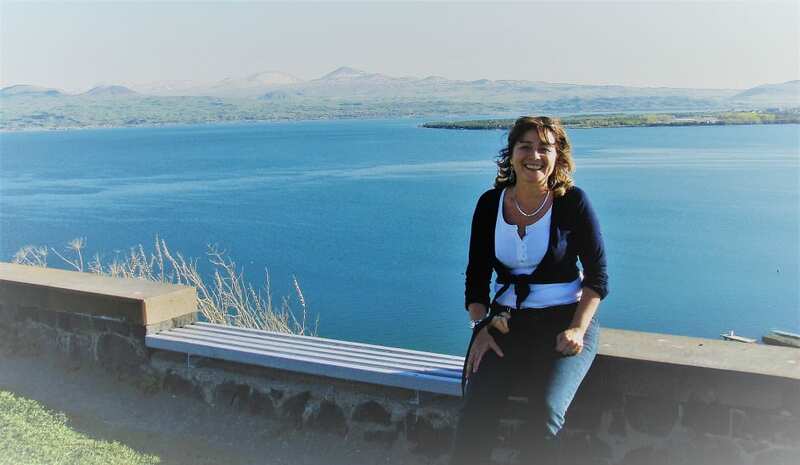 Now I’m retracing my steps along gleaming Lake Sevan (Black Van to distinguish it from the Van in Turkey). The two little monastery churches on the peninsular are still scenic and it’s still hard work, climbing the 200 odd steps to reach them at an altitude of 1900 metres. 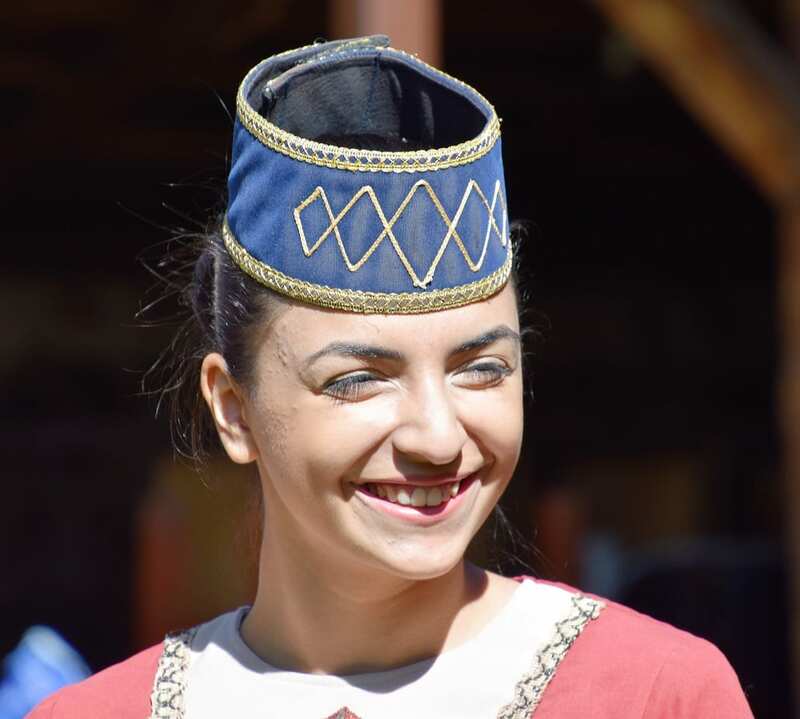 There’s a stop at a village called Dilijan, which is billed as a reconstructed street. It’s more of a little tourist trap with shops jammed with souvenirs and a ‘masterclass’ from a ceramicist, in the hope of inducing us to buy his pots. The foliage here is just beginning to turn and there are dappled patterns all along the hills, below the snow painted peaks. Then a monastery new to me. Haghhartsin, with its twin spires and several churches stands in another gorge, stunning with the autumn foliage. It has been restored since my last visit, with money was donated by the Emir of Sharjah. This is somewhat surprising, as he is, naturally, a Muslim. But he is said to have found the site to be exceedingly beautiful- he also visited in the autumn. The bus wends its way along the Azeri border- a hotbed of tension even away from Nagorno-Karabakh. The hills are green and smooth, here rolling away in huge velvety folds. There are some abandoned (and roofless) houses. We have already suffered the inconvenience of having our train hijacked. 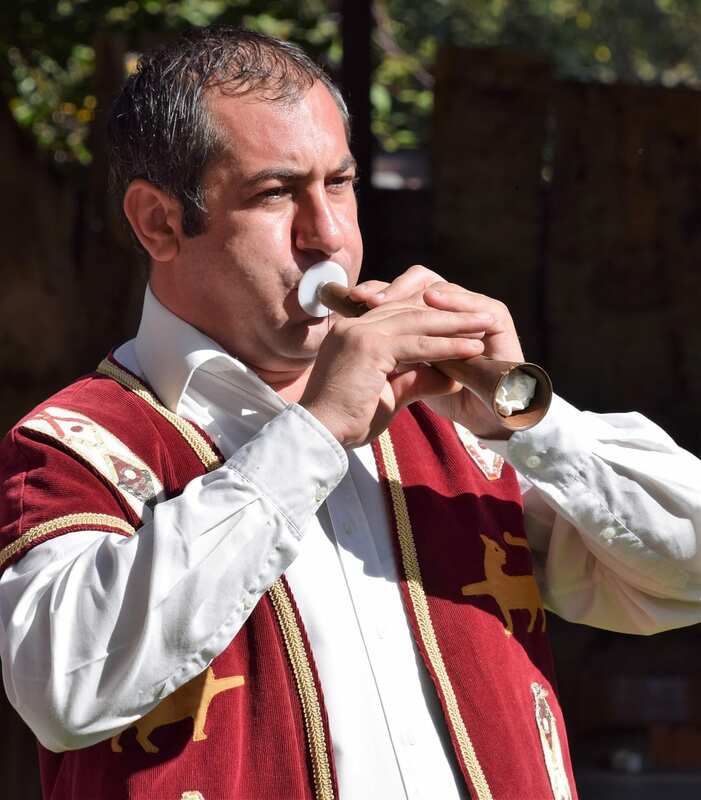 Our local guide, who has much to say about the injustices perpetuated by both the Turks and the Azeris has numerous stories of people who have been denied entry to Azerbaijan because they have Armenian connections. The most bizarre involves an American woman whose first husband was Armenian. She has since remarried, but is still not allowed in. I’m seriously beginning to wonder if we will be permitted entry having spent three days in Armenia. But first Georgia. 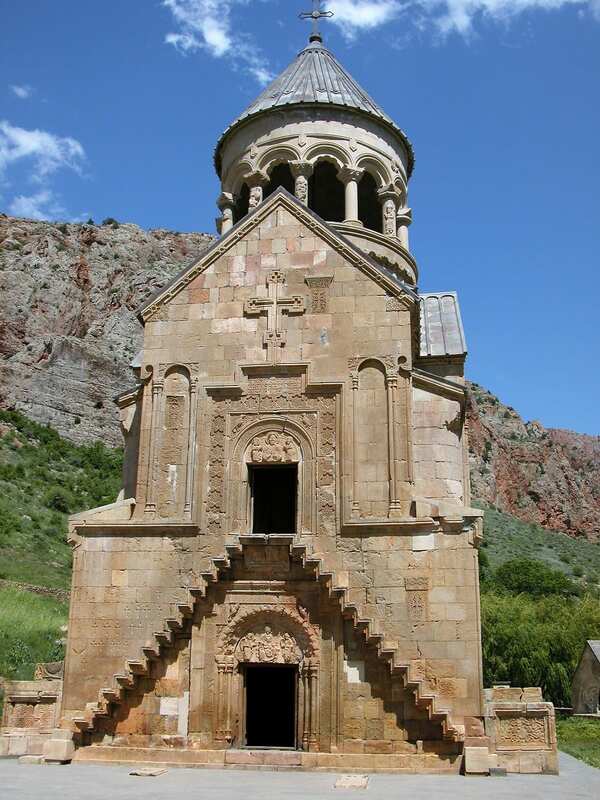 To see more of my photos of Armenia, visit this page. In 1915 the Ottoman government orchestrated the systematic extermination of 1.5 million Armenians, an act known as the Armenian Genocide. Turkey, the successor state of the Ottoman Empire, denies it was genocide, but governments of 28 countries – including Britain, Russia and France – say otherwise. More Armenians (5.6 million) live abroad than in Armenia (3 million). Many people fled abroad in 1915 establishing strong communities in the US, Russia and France.